Veterans of the country’s liberation struggle are making overtures to MDC leader Morgan Tsvangirai to work with President Emmerson Mnangagwa through a yet to-be-tabled arrangement that might result in the postponement of general elections, the Daily News can report. Although Mnangagwa has announced that the country would go to elections no later than July, his allies are engaged in behind-the-scenes manoeuvres to strike a “confidence-building” arrangement with the MDC leader in the hope of breathing life into the country’s tottering economy. late last year through a “soft coup”, the economy continues to be on a free-fall due to lack of investor confidence and chronic polarisation, among major political actors. Zanu PF politburo member and Zimbabwe National Liberation War Veterans Association (Znlwva) secretary-general Victor Matemadanda told the Daily News yesterday that they would want ordinary people to guide them on the sort of future they would want to see in the former British colony. He said the outcome of their consultations would form the basis of Znlwva’s engagement with Mnangagwa. A fearless group that campaigned for Mnangagwa’s ascendancy to power, Znlwva is scheduled to hold a massive rally at the Zimbabwe Grounds in Highfield to afford concerned citizens a platform to air their views. Matemadanda said if people say they want Tsvangirai to be part of the new dispensation, theirs would be to convey the message to Mnangagwa, who is on record saying "the voice of the people is the voice of God". After organising a mega demonstration on November 18 where thousands of people called for the resignation of former president Robert Mugabe, Znlwva wants to go back to the people to hear their views on a government they want. people of Zimbabwe as a whole,” said Matemadanda. played and we want to ask the people on the way forward as Zimbabwe,” he added, without giving a date on which the rally would be staged. Znlwva said for their input to be useful, people should be open in their assessment of the new government, adding that the visit by Mnangagwa to Tsvangirai’s home this month fits into the narrative of the new Zimbabwe they wish to see “where people work together”. “We want the people of Zimbabwe to tell us who they think is the best man for the job and who do they want to work with the president. If people say they want Tsvangirai, then that is what we will take,” said Matemadanda. He said Tsvangirai has been in the trenches long before those in Zanu PF became alive to the need to root out Mugabe’s dictatorship, and he has so many people who follow him. “We hope that his people will join us and we will listen to their demands on the way forward. 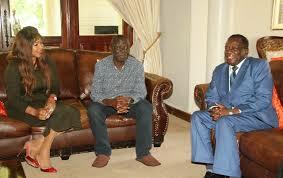 If the people want him (Tsvangirai) in government, then we will take the same message. Remember people demonstrated and said they wanted ED even after he had been fired and we made sure he returned because that is what people wanted”. When Mnangagwa ascended to the throne last month — riding on the coattails of the military — there was a universal expectation that he would form a government of national unity with Tsvangirai and other figures in the opposition. However, talks between the parties collapsed, forcing the Zanu PF leader to go it alone. Despite the collapse of the talks, Mnangagwa has been sending positive signals to Tsvangirai. Early this month, he visited the ailing opposition leader at his Highlands home in Harare—in a gesture that warmed the hearts of many. It was during the visit that Mnangagwa promised to look into Tsvangirai’s pension and offered to assist him with his medical bills. Zimbabweans still have fond memories of the inclusive government era when the country experienced economic growth for the first time in years, with prices falling. The relief ended when Mugabe forced the liquidation of the unity government in 2013 so that Zanu PF could go it alone. Thereafter, Zanu PF’s desperate efforts to jump-start the country’s economy have failed with public anger against government swelling. Even after the change of guard at Munhumutapa Building, Zanu PF has found the going tough on the economic front with prices of basic commodities shooting through the roof. Despite Mnangagwa crying hoarse to lure investors, the situation closely mirrors the days of Mugabe when life for ordinary Zimbabweans was near unbearable. To turn around the situation, there are forces in both Zanu PF and the MDC that believe that confidence has been the missing link in their efforts to resuscitate the economy, which can be regained once the major political parties start to work together. But that could mean delaying the elections by a minimum of two years. Mnangagwa’s spokesperson George Charamba, who is attending the World Economic Forum in Davos, hinted recently that they could be a poll delay at the behest of Tsvangirai. “Tsvangirai asked if we could delay elections, his reasons were couched on legalism. The president said there was need for a formal submission on the issues that needed attention so that they could be considered. “What you need to understand is that the processes of communicating with government are different, you need formal legal submissions, then after the submissions are made, they are negotiated and we go to Parliament with an agreed position. What should be noted is that where there is consensus, reforms can be done in one day,” said Charamba. But constitutional law expert Lovemore Madhuku said the only way elections could be postponed is through amending the Constitution. Constitution. Such an amendment could be done through Parliament because it does not require a referendum. This Constitution is very weak,” said Madhuku. While Zanu PF spokesperson Simon Khaya Moyo could not be reached for comment, MDC spokesperson Obert Gutu told the Daily News that they were always willing to work with war veterans and will take part in the indaba. “The MDC has always respected war veterans as gallant sons and daughters of the soil. In fact, we strongly feel that war veterans haven’t been given due and adequate recognition by the government of the day,” said Gutu.